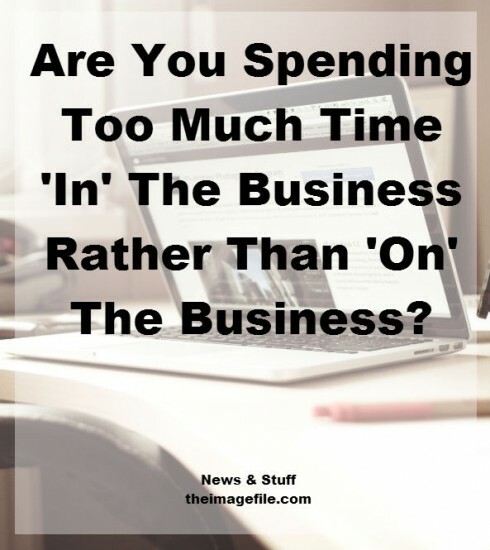 A common problem, more so with small businesses, is that the owner is often spending too much time ‘in’ the business rather than ‘on’ the business. This has a significant impact on the long term growth of the company. Being too busy doing your ‘day job’ can prevent time being spent on important matters such as sales and marketing, which clearly need the attention to help grow the business. As a photographer, you are naturally inclined to focus on the ‘day job’ and why wouldn’t you? To the outside world you are like an iceberg – they see the person with a camera in hand, stationary or fluidly moving around an event or location. They don’t see the majority of your time spent in front of a computer, editing down the thousands of images to the best selection and then the careful touching-up process to ensure the best-printed results. Very easy to be busy, given the amount of material one has to work with. The reason you are in business, following your passion, has to be a constant priority. Keeping up with latest techniques and fashions, eyeing (even if you’re not buying) the best technology or classic old school pieces of kit, and learning from the best – in person or by research. So that you can continue following your passion, keeping your business in shape has to run a close second if not equal first. Keeping everything moving forward as efficiently as possible, profitably, is a challenge that will keep testing and annoying you. Establishing routines and strategising will enable this process and give you moments of victory and satisfaction too. It is easy to create a siege mentality, you against the world. Creative as you are, perhaps other tasks are better delegated or outsourced to professional others. We at theimagefile realise this, hence why we’ve listened to photographers who want a new/better web site but haven’t got the time to build one, or our existing customers who need theirs refreshing but equally do not have the time to do this. We’ve listened and now offer this web build service for a modest fee. Creativity can be applied across your business, not just your passion of photography, and being creative with your sales, admin and marketing ideas will provide you with surprise relief. This may lead to some unusual business practices but many of the best businesses succeeded by doing things differently to how everyone else was doing it. Look at the huge successes of Uber and Netflix. Importantly staying creative will stop you and the business becoming stale and uniform. If this kind of culture seeps in, the reasons people might find you interesting will disappear and what differentiates you from others will also fade. Keep things fresh and inviting, people will react accordingly, it’s also more fun too! How do you work ‘on’ your business? Do you think it’s more important to work ‘on’ or ‘in’ the business?